Today's post is about that uniquely American food, barbecue. 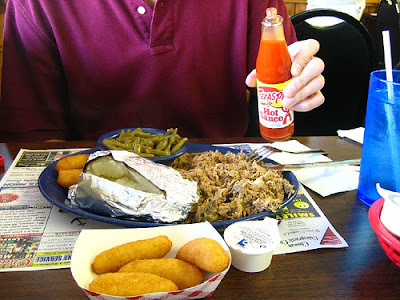 Specifically Carolina Barbecue, which we lustily ate last week on the way to our vacation on the North Carolina shore. 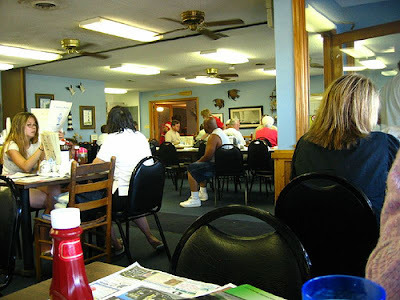 My secret for finding solid barbecue is this: wherever we're staying, I ask the girl at the checkout desk (in this case it was the Hampton Inn in Edenton, NC--and it was quite nice and clean by the way) what her favorite barbecue place is. 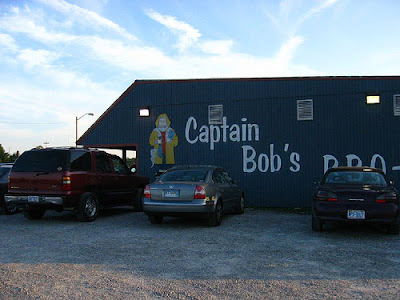 She told me to head over to Captain Bob's about 15 miles away in Hertford, NC. We knew this place would be great the minute we saw the cheap chairs, formica tables and paper placemats. Heck, my hopes started soaring the minute I saw the gravel parking lot full of American-made cars. Sure, NYC has its BBQ places, most notably, Virgil's and Blue Smoke, but there's something deeply irritating about paying $100 for dinner for two. It just doesn't seem appropriate to charge that much for barbecue--it kind of ruins the vibe (I'm thinking about Blue Smoke specifically here, Virgil's is a bit more reasonably priced). 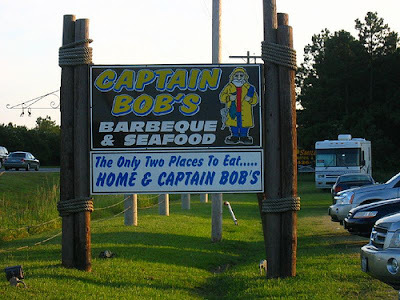 Better to spend $19.89 for dinner for two (okay, it was $25.00 including tip) at Cap'n Bob's for some of the best BBQ we've had in a while, complete with delicious hush puppies and of course, mooshy beans! Keep in mind, we're now on vacation from our normal diet, which is based primarily on quasi-vegetarianism. 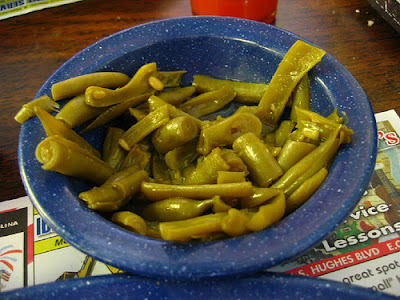 Thus there's just nothing like sitting down to a big plate of shredded meat with a bottle of Texas Pete's in hand. Some might call this just another example of mindless eating, but I see this as more of an example of following Rule #10: Let down your guard once in a while. And of course I can't leave out that this $25.00 dinner also included a 2,000 calorie slab of peanut butter pie. 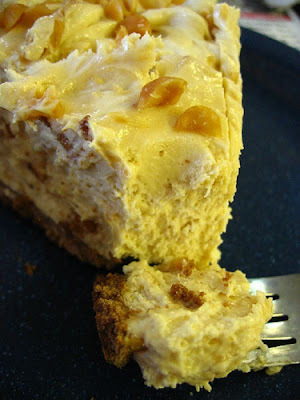 Calling it a "piece" of pie would be a gross understatement. I could tell by the glint in her eye that Laura was only going to let me have a very small taste. Yesiree, dem looks like mighty good eatin's . . . boy! Hush Puppies need to come back to the north... I am living vicariously through you both!! Thanks for your comments Kevin and CharlieM! They WERE mighty good eatins... and yep, I just CANNOT find hush puppies up here that even remotely compare to the ones we had in North Carolina. Yep, I've seen the golf ball shaped hush puppies but never in North Carolina. The ones I've always seen in NC are the, uh, phallic ones. BBQ good, hush pups bad.